But what happen to you??????? I read this book years ago, I have since read it several times over; I don't usually re-read novel. This one is like a favorite movie. My only problem is that she has not written another book. I love the story and her style of writing. 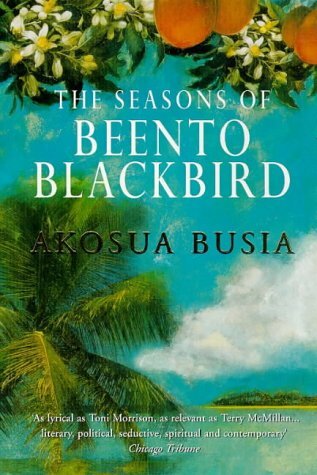 This book paints the story of a brilliant but realistically flawed protagonist (Solomon), cycling through seasons of living with a Carribean wife, a Ghanaian wife, and a woman in New York City who abstains from commitment for ten years because she is secretly in love with him. Being an American man, I couldn't help but roll my eyes at the blind devotion of the three women towards a character who isn't convincingly charming in anything other than description. The book does take too long developing, with no real plot until about halfway in. However, this book begins to become compelling once Solomon breaks his seasonal pattern and is forced to confront his polygamy, which is only acceptable in the Ghanaian culture but in practice not satisfying to anyone. It's hard to sympathize with Solomon, who, despite his professional significance as a writer bridging multiple cultures, is utterly flaky, selfish, and irresponsible in his treatment of women. But this is a realistic and cross-cultural look at what makes committed relationships work. I read this book for the first time 6 years ago. I enjoyed it so much that I have been waiting with bated breath for Ms. Busia to write another book. I suggested Beento Blackbird for my book club and recently re-read it. It was even better the second time around. This is on my top 10 list of all time favorite books. Ms. Busia is a very gifted writer and story teller. The way she linked the Carribean, Africa and the United States through the experiences of one man (Solomon) was masterful. The thing that most impressed me about the book was that she dared to tackle a "taboo" subject, polygamy, and did it in such a manner as to not put off the reader. As an American woman, my instinctual response to Solomon would be to dislike him and write him off as a cad. And, to some extent, I feel that he was a cad. However, I was still able to care about him and empathize with him. I also liked how she presented the subject matter from the point of view of the wives, Miriam and Ashia. I was able to understand their motives and why they made the decisions they made, whether or not I agreed with those decisions. Another thing I liked is that all three main characters were strong. Even in times of weakness, you could still feel their strength. Neither character sold themselves out. I respected them. By the same token, the author's character development was so complete that even the peripheral characters were significant and I was able to see their importance to the story. Her prose is very lyrical and descriptive. I felt transported to the Carribean and Ghana. I could feel the breeze from the ocean, I could smell and taste the foods, I could see the people and their activities, I could hear the music, the language... I was completely enthralled. I love when a book takes me to another place and I feel as if I am walking right beside the characters as they are living their stories. This book does that for me. Some members of my book club commented that she was a bit too "wordy" in the beginning (I did not feel this way), but were glad they "stuck it out" as the story unfolded and they enjoyed the rest of the book. I also like that the ending provides closure. You are fairly certain of the fates of the characters and not left "hanging." Very well written! I bought a copy for myself and my fiance who is studying in Ghana and we have enjoyed being able to read it together! I read this book several years ago and loved it. I bought it just to read again and it was just as good the second time. The writer explores relationships from a man and womans perspective and reflects on how our childhood really affects our choices in relationships. Easy read, very easy to transform yourself to the coast of Africa and to the Islands and watch the story unfold.